Figure 2: Additional components have been put into place, but wiring is incomplete. 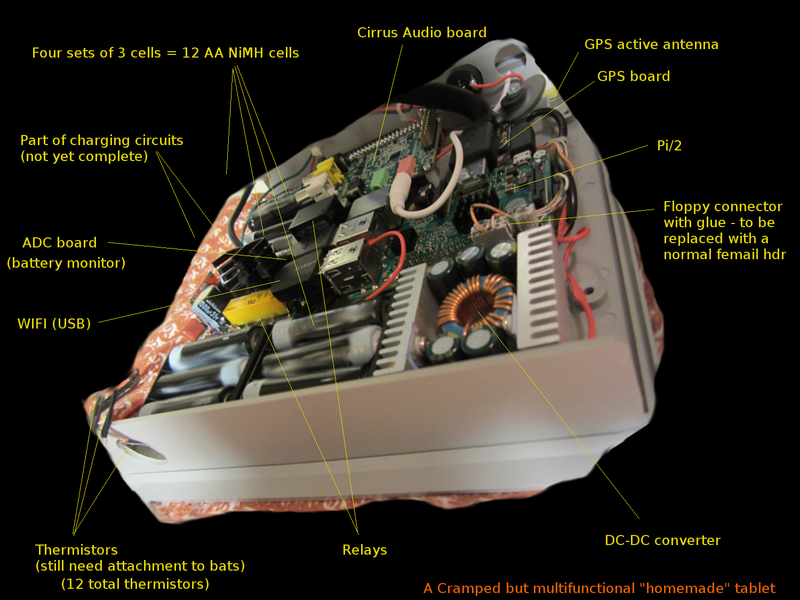 In figure 2, it can be seen that the little “homemade” tablet is getting quite cramped. Note that I did not mount the Cirrus card on the 40 pin IO connector of the Pi/2. This was to facilitate use of the GPIO pins for other things. There is also a vertical clearance problem to deal with. So, there will be individual wired female header lines coming from the audio board to the Pi/2 J8 connector (not yet in place). 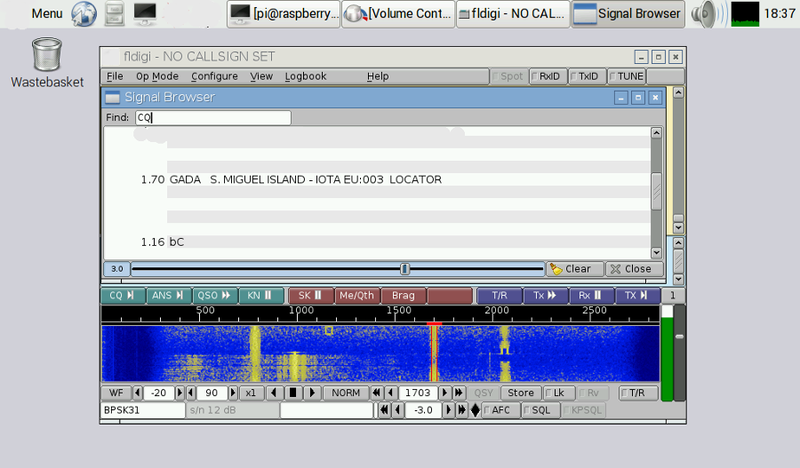 Figure 3: FLDigi is shown running on the Pi2, decoding a BPSK signal, using Cirrus audio. The Cirrus adapter worked just fine on the Pi2, as can be seen in figure 3. I took the audio first from the “phones” jack of an old amateur radio receiver, and then from the sound card of a second PC running a browser webSDR page. This audio was connected via the “line-in” connector of the Cirrus adapter in the Pi2 box. In both cases the audio was very good, and was adequate to decode signals while using a only a moderate input level. The noise and spur levels were much less than on an i386 PC based machine I had used for FLDigi/ham activities in the past. For the test run shown in the graphic (above) I “temporarily” mounted the Cirrus adapter on the Pi2 board. Later, as I began to route the wires to the dismounted board, I decided that A) it was going to be too messy, and B) there could be feedback issues, etcetera. So, I changed plans, and decided to mount the Cirrus board on the Pi2, as per the normal way. To get around the vertical clearance problem in my “tablet” form-factor enclosure, I desoldered the left and right SPDIF connectors, and the extra power connector. While the removal of those parts was good for less than a quarter of an inch additional clearance (because the expansion header (feature header – J2) of the Cirrus adapter remains on that side of the board) – it was enough to get the job done. Note: This author and site is not affiliated with the Raspberry Pi in any way. For information about those projects visit http://www.raspberrypi.org. “Raspberry Pi” is a trademark of the Raspberry Pi Foundation. Cirrus Logic makes the audio board shown, and is not affiliated with this site or author in any way. Figure 3 contains a screenshot that contains an image of a program that has been released under a free software license (FLDigi, located at http://www.w1hkj.com and the license at https://www.w1hkj.com/FldigiHelp-3.21/html/license_page.html). The license is GNU GPL v2. As a derivative work of that program, the part of the screenshot that contains it falls under the same license (GPL2). Figure 3 also contains elements of a desktop system and associated programs that have been released under a free software license (Copyright: LXDE team: http://lxde.org). As a derivative work of that program, the respective part of the screenshot in Figure 2 falls under that same license. The full text of the licences (GPL 2.0+ and LGPL 2.1+) may be found at http://www.gnu.org/licenses/old-licenses/lgpl-2.1.en.html and http://www.gnu.org/licenses/old-licenses/gpl-2.0.en.html.